Stunning New 6 Bedroom Home available for Vacation rental in the Aspen Valley area in Colorado, easy 25 minute drive to Aspen and Snowmass resorts. World Class Skiing, Winter Sports, Dining, and Shopping. Wonderful lake and mountain views. Great place for entertaining! This Spectacular 6 Bedroom Home is filled with many amenities, including: Movie Theatre, Master Suite with floor to ceiling Imported Italian Marble Shower, Guest Master Suite, Pool table, 2 Family Rooms each with a Fireplace, Gorgeous Hardwood Floors, Cathedral ceilings and open floor plan-make you never want to leave! LUXURY, LUXURY, LUXURY, in the Rocky Mountains! Wireless Internet Access. Can easily accommodate 2 families. The beds and bedding are luxurious there are 2 King Beds, 2 Queens, 2 twins and 1 Double. Contact Owner for Details !!! We had a great stay. The house was clean, tastefully decorated, and spacious. We were in town for skiing, the house is about 30 minutes from the slopes, but only a 5 minute drive from the express bus, providing flexibility. Host was responsive and helpful. Thanks for a great stay! My family and I stayed here for a weekend and it was absolutely fabulous! The house was beautiful and very clean. We made full use of all the space from movie nights in the home theater room to breakfast on the beautiful deck. They have thought of everything. The location was perfect too, close to town and ski locations. Peter, the homeowner, was great! He had fantastic restaurant recommendations and overall was just a nice, easy going guy. Everything was truly exceptional, we can't wait to go back! Incredible vacation home just outside of Aspen. We went out with our kids and another family for some Spring skiing and this is exactly the type of home we were hoping for. Two Master bedrooms for the adults and plenty of space for the kids. We loved that at the end of the night the older boys played pool and the younger kids watched a movie, while the Adults got to unwind upstairs by the fire. The home is very spacious, the furniture is nice and comfortable and we appreciated Heather's art in the house. All the appliances and bathroom fixtures are high end which is way more than we expected. Loved the Weber gas grill outside which came in handy. Heather and Peter were great to work with, very accommodating. I would highly recommend staying here and we plan to come back over the summer. The house does have a nice presentation but we did have quite a few problems that were not addressed. The master bathroom tub held water from the first day we were there until 5 days later. The dishwasher did not work properly. After leaving, we did NOT get our deposit back and were blamed for a list of underlying problems. The house was cleaned spotless two days before departure and somehow it was a 'wreck' when the cleaning lady arrived. If you don't mind losing your deposit nor using the bathroom, then this is the house for you! Our flights were delayed and did stay later than check-out. I understand the cleaning ladies had to wait for us to leave causing an increase in the cleaning fee, which I did not have a problem with. The owner decided it was best to keep the entire deposit. 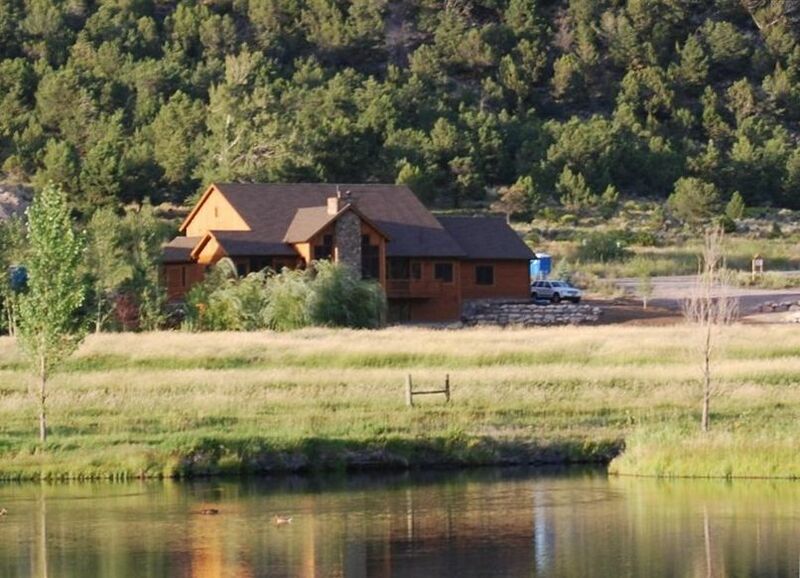 We take great pride in providing our guests with an amazing and care-free home to enjoy their Colorado mountain vacation. Unfortunately this young group of travelers were not respectful of the care and great pride we take in our home. If they had communicated that they were having a problem with the Master tub, we would called our Plumber immediately and the problem would have been solved. The dishwasher was in working order and they were informed prior to their stay that a repairman was coming out to replace the filter in the dishwasher and in the refrigerator, their claim that it was not working is false. If they had asked for a late checkout we could have worked with them, instead they chose to leave our cleaning person out in the cold, in her car, for 3 hours. When she finally got in, the house was trashed; a burn on the coffee table, AV system completely messed up and towel hooks ripped from the wall. After their visit I had my handyman come out to fix the holes in the wall, an Audio/Video specialist out to reinstall the LED projector and adjust all the A/V settings. The damages were over $1500.00 and yet they were incensed that they did not receive their deposit back so they wrote a poor review. We provide a beautiful well maintained home for your vacation, maintain it meticulously and we have been very fortunate to have respectful and extremely appreciative guests. If there is ever a problem we want to know about it right away and we will do our best to solve it as soon as possible. We are sure you will enjoy your stay at our home. Thank you. This house is so beautiful, and is located in a perfect community! We were thrilled to be in such a gorgeous spot to relax after river rafting, hiking and bicycling. The owners have really thought out how to make a vacation home comfortable and fun! My husband and I wanted to let you know we loved our stay at your beautiful new home. We are renovating a place in Snow Mass and now wish that we had bought in Carbondale. It is a short commute to the mountain with out all of the crowds. We will definately recommend your place to our friends for the ski season!